The San Francisco artist group Rebar has installed their new temporary installation Seattlight at King Street Station’s newly refurbished Jackson Plaza. Seattlight is a nighttime, interactive artwork designed to highlight the unseen pathways of pedestrian traffic through the plaza. The artwork lights up in response to the movements of people as they walk past and through the space. The artwork was commissioned to celebrate the new public plaza created as part of the King Street Station restoration. Seattlight will remain on view throughout 2012. Rebar’s work encompasses public art, landscape design, urban intervention and temporary performance installation. The team has exhibited and lectured worldwide, including at such venues as the Venice Architecture Biennale, ExperimentaDesign Amsterdam, ISEA 2009 Dublin, the American Institute of Architects, the Canadian Center for Architecture and the Harvard Graduate School of Design. Seattlight was funded by Seattle Department of Transportation 1% for Art funds and administered by the Office of Arts & Cultural Affairs. Images: Rebar, Seattlight, 2012. Located at King Street Station’s Jackson Plaza. Photos courtesy of the artists. It was a dark and stormy First Thursday Art Walk night, and the artwork at King Street Station was not alight. Thanks to those of you who came out to see San Francisco artist group Rebar’s temporary installation Seattlight at King Street Station’s Jackson Plaza last night. We had hoped to open the project, but the artwork was damaged in transit to Seattle. The artwork is now projected to open in the next several weeks. We’ll keep you posted, so stay tuned. Seattlight is a nighttime, interactive art piece designed to highlight the unseen pathways of pedestrian traffic through the plaza. The artwork will be on view through the end of the year and will light up in response to the movements of people as they walk past and through the space. Rebar’s Seattlight is a nighttime, interactive artwork designed to highlight the unseen pathways of pedestrian traffic through the plaza. The artwork lights up in response to the movements of people as they walk past and through the space. Seattlight was commissioned to celebrate the new Jackson Plaza, created as part of the King Street Station restoration. The artwork will remain on view throughout 2012. Parking is limited. The site is accessible by bus, light rail or bike. For more information, contact Vaughn Bell, public art project manager, (206) 733-9960. The San Francisco artist group Rebar will unveil their temporary installation Seattlight at King Street Station’s newly refurbished Jackson Plaza, 8 to 9 p.m., Friday, April 20. 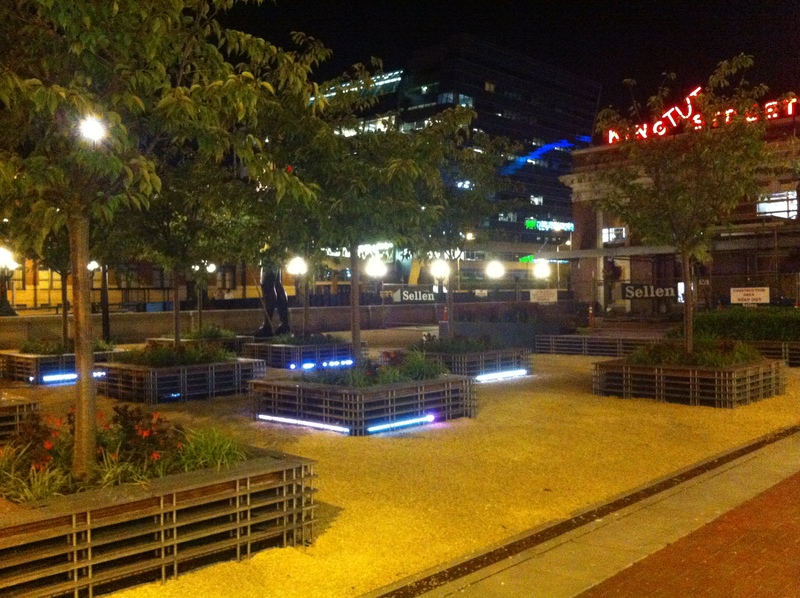 Stop by the station at 303 South Jackson St. and meet the artists as they light up the plaza. Seattlight is a nighttime, interactive art piece designed to highlight the unseen pathways of pedestrian traffic through the plaza. The artwork lights up in response to the movements of people as they walk past and through the space. The artwork was commissioned to celebrate the new public plaza created as part of the King Street Station restoration. The artwork will remain on view throughout 2012. Image: Rebar, Seattlight concept illustration.